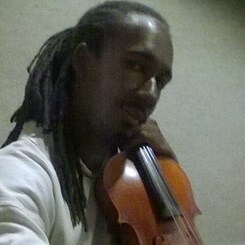 Aaron J. Gooding, Jr. earned his Bachelor of Arts in Music Degree from Mansfield University on viola. Prior to attend Mansfield, Aaron graduated from the Philadelphia High School for the Creative and Performing Arts. While at CAPA, he was a three time member of the All Philadelphia High School Orchestra. He is a product of the Settlement Music School where he studied with Gregory Lipscomb. Since graduting from Mansfield, Aaron has taught in various after schol instrumental music programs. In 2007, he taught alon with Tanya Murphy, of Eboni Strings, at the Discovery Charter School in Philadelphia. His students ranged in age from 10-12 years old. Also, in 2007, Aaron was an instructor with an after school youth string ensemble at the Mt. Carmel Baptist Church in West Philadelphia. This group was comprised mostly of high school students. It was in 2008 that Aaron began to teach at the Philadelphia Clef Club for the Performing Arts, located on the Avenue of the Arts in Phildelphia. At the Clef Club, he taught Music Theory and individual violin and viola lessons in their Saturday Eduction Program. Aaron taught violin, viola, and cello in the after school instrumental program, where students ranged in age from 7-12 at the Clef Club. In October of 2014, Aaron started to develop the orchestra program out of Nativity of our Lord school in Warminster, PA.
Aaron perfroms frequently throughtout the area in churches, weddings, social functions, and Broadway music productions. He has perfromed with the St. David's Orchestral Society of Eastern University. In June of 2013, Aaron began teaching at the Music & Arts in Horsham, PA helping private students in violin, viola, and cello. Request Lessons with Aaron today!